Our 2012 sponsors were the following amazingly generous companies and schools!! Neil Bomford Haulage - for supplying the articulated trailer every year for the summer project and for providing a green card for the Christmas trips. Brentwood Communications ltd for supplying of Two Way Radio equipment for use on each trip made by TEECH. Cedric Coaches for supplying the coach to transport volunteers to and from Moldova for many years. Altro Floors for donating lino flooring for the 2011 and 2012 projects. Water for Work and home Ltd Imagine a company that is passionate about the water we drink, which delivers on time with well presented pleasant staff and actually understands why we drink water and how vital hydration is to the human body. 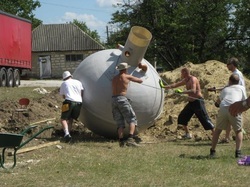 Drain Depot Provided a septic tank for the 2012 trip to Moldova at a discount. MR Currell Ltd Painting Contractors based in Colchester, Essex – donated a large quantity of paint which was used in 2011 and again in the School on the 2012 trip to Moldova. 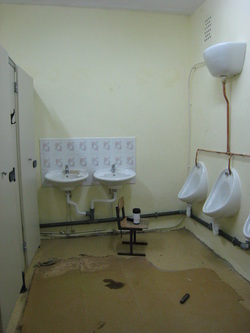 Suffolk County Council – for allowing TEECH to remove toilet cubicles from a closing school for re-use on the 2012 project. P&O Ferries – for the discount provided on the ferry crossing on summer and Christmas trips for the TEECH Van. Harbour Shipping – for the assistance with the customs paperwork for Moldova. Christchurch Church, Clacton for the many gift bags they provide for us to take out in the summer and at christmas to provide present to lots of children. In 2011 we took a septic tank to Moldova. Drain Depot provided us with a discount on the tank and again helped us in 2012. The tanks are required to install drainage/sewage when a building has no facilities at all and we want to install toilets for the community. Bathroom Studio Superstore, Clacton have provided TEECH with a discount for a number of years to enable us to buy the sanitary ware we require for a project within a tight budget. CSD UK - Customer Service Direct is a partnership between Suffolk County Council, Mid Suffolk District Council and BT. The company provided support for nine volunteers to go on the 2011 trip to Trebujeni, Moldova and match fundedmonies raised by the nine, meaning that TEECH could buy a new van. Colchester DVLC Scooter Club Long standing supporters of the charity through monetary donations. St James’s Place Foundation - The St. James's Place Foundation founded in 1992, is the charitable arm of the St. James's Place Wealth Management Group. The Foundation seeks to achieve direct, tangible results from the support given.The foundation have supported TEECH through monitary donations which are then used to buy equipment for projects. Edelweiss Nursery (Ipswich) Parents and children of the nursery helped put together baby and toddler shoeboxes to taking to the orphanage and villagers this summer. They also support the Christmas Shoebox Appeal.